The four-wheel drive SUV-derived van market has always been slightly niche. Apart from Land Rover’s venerable Defender 90 and 110, it has been left to companies like Mitsubishi with the Shogun and Outlander commercials, along with SsangYong’s Korando and Rexton LCVs to satisfy the few buyers looking for an all weather, all-terrain car-derived van. Though only offering around half the payload of a comparable double-cab pick-up, at around 500kg, the all-wheel drive van delivers an improved drive and greater load security. Customers typically include farmers, construction managers, forestry and utility companies. We’ve experienced the Outlander PHEV in car form, and its hardly surprising that Mitsubishi is also offering it as a van. Indeed the PHEV Commercial is available in three trim levels, as the GX3H 4Work that we have here, as a higher spec GX4h and as a range-topping GX4hs. The base model is hardly basic though, with 18-inch alloys, cruise control, climate control, Bluetooth, front fogs, rear parking sensors and electric folding and heated mirrors. The Outlander also comes with Super-All Wheel Control (S-AWC) which combines front and rear drive for both slippery road conditions and for off-road forays, though slightly chunkier tyres might be best for those looking to spend a lot of time on the rough. In EV mode the vehicle is powered by a lithium-ion battery pack. This drives a front axle electric motor with up to 60kW and 137Nm of torque, plus a rear motor that can deliver 60kW and 195Nm. As with all electric vehicles this torque can be called upon at any time, providing rapid acceleration and strong overtaking ability. 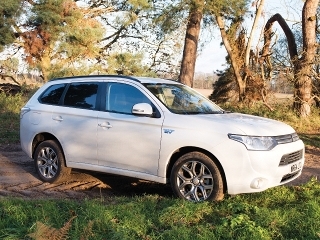 The Outlander uses a 2.0-litre petrol engine to charge the battery in Series Hybrid mode. However if you require full acceleration or want to drive at higher motorway speeds, the petrol engine will also power the front wheels in Parallel Hybrid mode. The driver can decide to save electric power for urban use and drive on the engine, or to charge on the go while the engine is also powering the wheels. During deceleration the motors also function as generators, pumping electricity back into the batteries. You can decide how effective this brake regeneration is using gear-shift paddles behind the steering wheel, oddly marked with a – for more braking and a + for less. The driveline is incredibly clever, works faultlessly and is deeply impressive. However, there is a problem. Mitsubishi promises up to 148mpg, and that just isn’t possible. The best I got in daily driving was 42mpg, with a trip into central London on electric power alone lifting that to 55mpg. That was with a full overnight electric top-up and I didn’t even save the £11.50 Congestion Charge, as you have to apply in writing to register, at a cost of £10! Which brings us to the question, who is the Outlander PHEV Commercial for? It works brilliantly in an urban operation, but why would you need a 4WD van in the city? Towing capability is limited, so it’s not going to appeal to farmers, while construction sites aren’t going to boast a rapid charging facility to boost electric use. Impressive technology, though it would take a very light foot and extensive electric use to get anywhere near the economy figure. A niche within an already small niche.